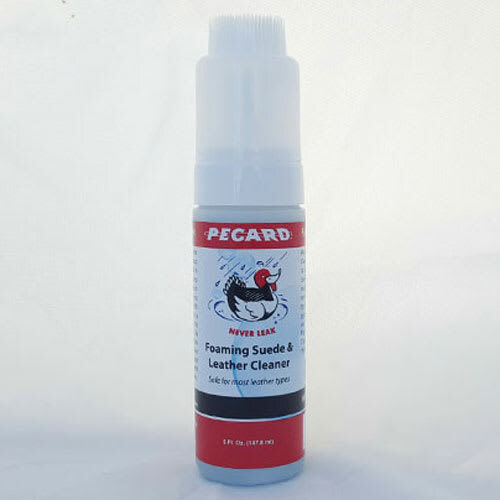 Pecard Foaming Suede and Leather Cleaner is formulated to clean all types of genuine Suede, NuBuck, textured smooth, and smooth leather articles. Removes dirt, grime, and stains caused by salt, grass, cosmetics, food, beverages, and others. Can be used for home, office, car, boat, or RV needs. Make sure that the leather item is colorfast before you attempt cleaning. Test in an inconspicuous area before cleaning the entire article. Hold the bottle in an upright position and pump a small amount of foam on the dirty area. Using the scrubber brush cap, scrub with a circular motion to work the cleaner into the surface. Do not over wet. When dry, brush the nap using a leather cleaning brush <link> or suede brush <link> Using a clean, soft cloth, wipe excess foam from all smooth surfaces. Repeat as needed.